All-American Michael Sam’s coming out is new and historic. The early reaction by NFL GMs is tired and bigoted. A couple of Sam’s straight football buddies even hit the gay clubs with him in the lead up to last month’s Cotton Bowl. One joined him at a pride march and, when the season ended, his teammates voted him most valuable player of the overachieving 12-2 Tigers. This narrative about the locker room is in many ways more important than the coming out itself. What sports general managers have always said in the past, whether they were speaking in the abstract or talking anonymously about unsigned out-and-proud NBA player Jason Collins, is that “the locker room” would not be ready for a gay teammate. No matter how many athletes have come out as allies, no matter how many polls show overwhelming majorities of pro athletes willing to have gay teammates, this is what was always thrown in the faces of fans: the “locker room” isn’t ready. And here was a living, breathing example of an SEC locker room that did not only survive having a gay teammate but thrived. What a story. For one hour, that song from The Lego Movie, “Everything is Awesome,” seemed to be playing behind every tweet, every Facebook post and every direct message. I exchanged e-mails with Cyd Ziegler and Jim Buzinski, from OutSports, two of the journalists who not only broke this story but helped strategize the timing of Michael Sam’s coming out. They have no illusions that the NFL is somehow a rainbow utopia waiting to happen, but as Cyd said, “I don’t think it will affect his draft stock much at all. It’s impossible to predict where anyone will be drafted, but the NFL is about winning. When it makes sense to draft someone of Michael’s skill, he’ll get taken off the board. I just hope it’s the Patriots so I can cheer for him every game.” Yes, everything was awesome. You read correctly. NFL executives, many of whom love acting like hyper-macho caricatures for the cameras, are fearful of the media-hordes from Good Housekeeping. For all the fake military rhetoric in the NFL about team executives” being “leaders of men,” they sounded like weak and scared little boys. The most cowardly part of all of this was that, in comment after comment, these executives absolved themselves of homophobia and bigotry by putting it all on the players. There is also an uncomfortable racial element to this in a league where over 90 percent of executives are white and 70 percent of players are African-American. Call it the myth of African-American homophobia. Yes, there is homophobia in every community, but there is a particular scapegoating of African-Americans as being the great block to LGBT social progress. We saw this when the anti-gay marriage amendment Prop 8 passed in California, and it is hard not to hear its echo in the anonymous statements in Sports Illustrated. The other mendacious part of this is—of course—since when do NFL executives ever listen to “the locker room?” The NFL, as is often said, is not a “player’s league.” Those under the helmet have, on average, about three and a half years in the NFL meat grinder before they are out the door. Every year is invaluable to whatever nest egg they’ll have once the cheering stops. If owners and general managers said that they were going to have a discrimination-free locker room, then that would be the law of the land. Yet in a league where fake tough-guy general managers who never played the game, goad players to “man up” and take the field with concussions, or try to stockpile their locker room with the Richie Incognitos* of the world, this is what you get. The NFL will continue to be a bigoted institution until its own leadership—its own executives—actually face up to their own bigotry. 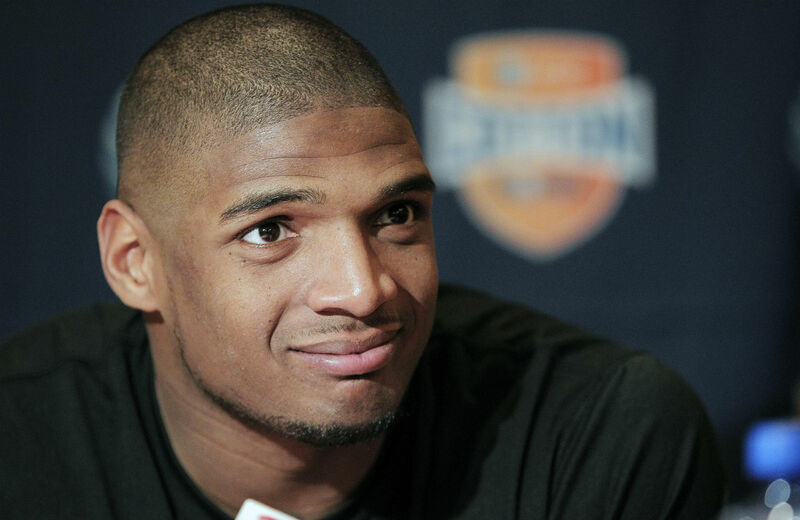 Michael Sam has said he wants to own his own truth. One wonders if the NFL will ever truly own theirs. * As I use Richie Incognito's name as a stand-in for negative locker room behaviour, it is worth noting that Incognito has already tweeted out support to Michael Sam, writing, "@MikeSamFootball #respect bro. It takes guts to do what you did. I wish u nothing but the best"